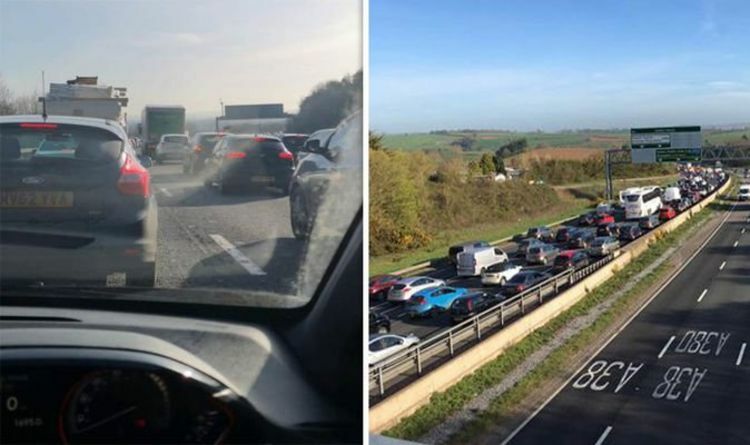 Motorists can expect up to 60 munute delays on the M5 today, with traffic piling up 5 miles back to Oxencombe. The entry slip and lane thee have now been reopened, following a two-hour long closure northbound just after junction 30 until junction 31 after the crash at about 7.45am today. The air ambulance was called to the scene after a passenger was trapped inside a vehicle. The man suffered serious hip and arm injuries and was transported to Derriford Hospital. Congestion is backing up for more than two miles up to the A38 as cars are diverted, with long delays expected throughout the day. A police spokesman said: “Emergency services are currently at the scene of a collision on the M5. “Police we called at around 7:40am with reports of a collision between a flat-bed truck and a van on the M5 just prior to Junction 30, northbound. “There is currently a closure at Junction 31, northbound. Two lanes are closed and this will become a full closure shortly to allow the air ambulance to attend. The entry slip road and lane three have reopened.